RAU Gallery: Arizona Jack Strikes Back! Cory: You only have one chance left, Talon. Talon: Allright, allright, is there a "G"? Cory: Nope, no G's. Sorry, Talon, you lose this round. Talon: Damn. So what was the word? Talon: You are such a damn cheater. Cory: The point of this is to expand your vocabulary. Talon: If it expands any more, my head is going to explode. 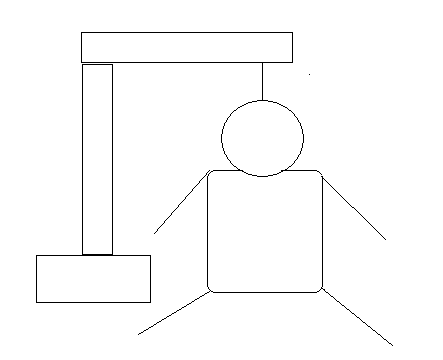 You know, your hangman is too big for the gallows. He's just sitting on the ground. Cory: He's still dead and you still lose. Talon: He probably died of word poisoning. Cory: Jack, WTF?!?! DON'T DO THAT!!! Jack: Ha ha ha ha ha ha!! Got you! Chris: I have decided to take on a superhero alterego. Preston: *cough* Might I inquire what your "superhero alterego" will be? Chris: My name will strike terror into the hearts of evildoers everywhere...Captain Crotch!! Chris: Well? What do you think? Preston: I think it's striking terror into the heart of someone already. Chris: Wanna hear my list of superpowers? Where facial expressions don't exist. Where Comic Sans MS font runs rampant. Where it's illegal to drive a car. And now, he's come to Grimmora U. to clean things up! Deuce: Got you all fixed up, Bubu. Seems you had a nail in your tire. Bubu: Oh, that explains that sharp pain in my right foot. Deuce: Well, it's now gonna be your left hand, since I rotated your tires, so keep an eye on it. Bubu: Okay. How do you think I got that nail? Deuce: *shrugs* Could've gotten it anywhere. It's nearly impossible to see a nail in the road when driving. Deuce: What the hell? 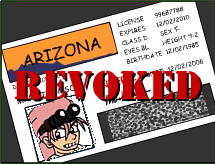 I don't even have a driver's license in Arizona. Talon: We better archive those comics, because if that site ever goes down, this sketch won't make any damn sense whatsoever. Cory: Since when has anything made sense around here?